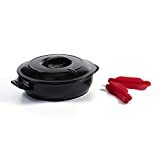 If you have a passion for cooking and enjoy the thrill of providing your family with nourishing and healthy food, then you must at some point heard of or come in contact with one of Xtrema cookwares. Well if you haven’t heard about them, then you need to pay attention to what follows next. Xtrema pure ceramic cookware company has over 40 years of experience in the glass and ceramic industry. The company has since 2004 dedicated all of its resources towards the manufacture of seasoned, non-toxic, safe, and metal free cookware. While it will be a little excessive to say all their products are 100 percent what they say they are, a huge chunk of Xtrema cookware products lives up to the hyped expectations. And given the unreliability of most metallic non-stick cookware in the market today, ceramic cookware is probably the only other safe alternative to turn to. Ceramic wares are known for their far superior versatility and heat conduction capabilities. So if you are looking to make a switch from your everyday nonstick metallic cookware to the dependability of ceramics ones, then you probably should consider starting with Xtrema products. To help you know more about what their cookwares look like and the qualities they possess, we have to put up this Xtrema cookware review. We’ll take a quick look at three of their chart-topping ceramic cookware and leave you to decide if they match what you are looking for. If you are ready like we are, let’s get started. First on our list is Xtrema’s FDA certified all natural ceramic 8-piece cooking set. Based on its physical appearance and texture, it is easy to believe the company’s claim that the entire cooking set is made from 100 percent natural ceramic materials. 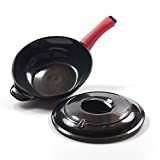 Its glossy appearance and feel give a strong indication that you wouldn’t experience any form of leaching while using the cookware during all of your cooking escapades. The cooking set comes with a Tradition Saucepans (1-Quart), a 1.5 Quarts Saucepan, 2.5 Traditions Saucepans, and a 16-ounce Traditions Saucepan. As expected, they all come with matching lids so you can always keep your food properly covered and tight during and after cooking. While the aesthetics of the set may not blow you away, you can always take solace in the fact that the cookware cannot be scratched. Your metal non-stick cookware, on the other hand, will always look battered after a few scratches. With all of these amazing features that this set of ceramic cookware possessed, we were still unsure about the cooking conditions it can endure. To be fair, after a few trials on stovetops, oven and grilling conditions, these ceramic cookwares came out unscratched. They are even dishwasher and microwave safe. So if you want to add natural cookwares to your already robust natural cooking routines, Xtrema’s Traditions Ceramic 8-Piece Cooking Set is an option you should consider. Next on our list in this Xtrema cookware review, is the specialized Ceramic Wok Frying Pan. It comes with a very beautiful silicone pot holder which should make frying food ingredients a lot more fun. What’s more, the entire body is made from 100% all natural ceramics which will not leach unwanted and toxic metals into your food. However, due to the slightly thin texture of the frying pan, you will have to be a little cautious while cooking. With all of the positives to enjoy from switching to traditional cookware, this rubs some shine off it. In fact, you can cause some cracks on the cookware’s surface and void its warranty in the process if you are not used to cooking slow and low. Most times, you will have to take subtle safety precautions before you commence cooking or frying. Asides this not too impressive aspect of the cookware, every other thing seem to add up and you shouldn’t encounter other challenges as long as you use the ceramic frying pan the right way. Its surface is not prone to scratching, but that doesn’t mean you should go ahead to use sharp-edged cooking utensils on it. Xtrema’s 100 percent Ceramic Frying Pan will probably last longer and retain its shiny and beautiful appeal if you use wooden or sometimes plastic cooking utensils. Like the 8-piece ceramic cookware on our number one spot, this ceramic frying pan is a bit versatile. You can use it in an oven, a microwave, and on stovetops. Your dishwasher won’t also have a hard time trying to clean it up. So just as there are positive sides to using Xtrema’s 100% Ceramic Wok Frying pan, there are also some ‘not-too-positive’ aspects that you’ll have to deal with. The good news is that all of these do not have an adverse effect on your overall cooking experience. It is easy to clean up and also dishwasher safe. Last but certainly not least is Xtrema’s short handled ceramic frying pan. Unlike its silicone handled sister, this one comes with a characteristic shorthand. So if you think the silicone handle may be problematic during cooking, this version offers another option. It has a ‘not-too’ flashy midnight color, which may not appeal to everyone. This, however, does not mean the ceramic frying pan won’t get the job done the way you want it to. It is 10 inches high and comes with a fitting lid that stops your cooking from splashing all over your kitchen slabs. Like you already know, its ceramic composition means that you can be sure that your food will be 100% healthy after you are through cooking. However, you still have to take some precautions while making use of the cookware. Extreme temperatures are a big ‘NO NO’ as you run the risk of cracking the frying pan’s ceramic cooking surface. You also can not store this ceramic cookware like you store your traditional non-stick metallic ones. In fact, to be on the safer side of things, do make sure you put a slightly thick and equally clean towel in between the sets before storing. This will prevent unwanted shocks and impacts from damaging the cookware’s surface. While this may sound as though this version of Xtrema’s Ceramic frying pan is fragile, the cookware still possesses some level of versatility. So it is not all doom and gloom. It can survive being used on stove tops, in ovens, microwaves, and dishwashers. You can also use it for grilling purposes if you choose to. For best results, do not suddenly place cold food items in the already hot Xtrema ceramic frying pan. A sudden drop in temperature such as this can lead to significant cracks on the cookware’s surface. Make sure that you thaw cold or frozen food items before proceeding to fry them. You can also use wooden or plastic utensils on the cookware to avoid scratching it. This is not compulsory since the Xtrema ceramic frying pan is ‘non-scratch’ in nature. However, it is probably best to avoid using metallic utensils. If you have followed this Xtrema cookware review, you probably would have observed that they all have similar characteristics and weaknesses. This is largely due to the fact that they are made from the same raw material; strong ceramic clay. Another glaring fact is that they are not 100% perfect. At some point, while using this ceramic cookware, you may have to deal with their disadvantages. But this is completely normal. There aren’t many cookware out there in the market today that can boast of being 100% perfect. This means that the advantages of using Xtrema ceramic cookware far outweigh the disadvantages. They are 100% natural and versatile and are going to be a perfect addition to any kitchen. Gotham Steel Pan Vs Red Copper Pan: Which Should You Buy?